PixelYourSite will track your store interactions by firing e-commerce specific events on every key action. These events will be sent to Facebook, Google Analytics, and Pinterest (if the free add-on is used). On each network, the event will have the standard name (when it exists). You can turn each event ON or OFF for every network. 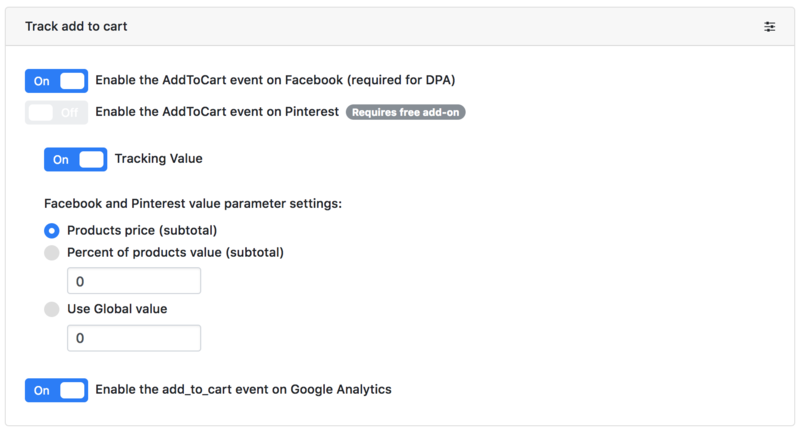 On some events, you can also enable or disable the value parameter for Facebook and Pinterest. Google Analytics events have a much more strict format and they don’t have this option. 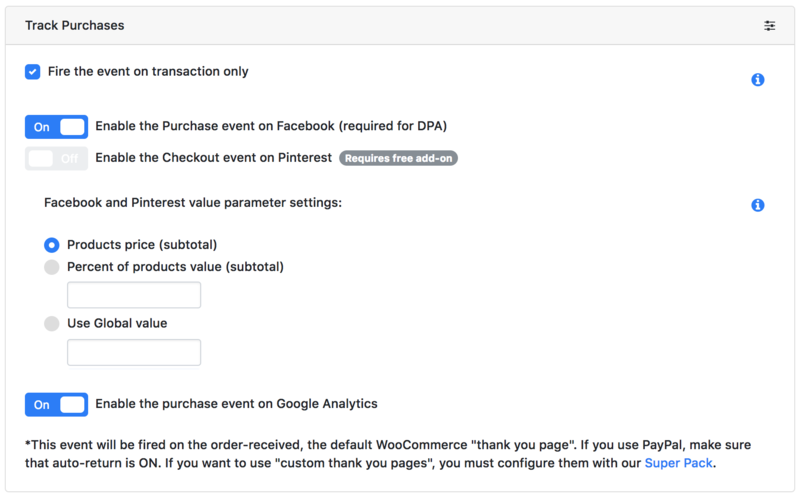 For Facebook and Pinterest, the value parameter is mandatory on the Purchase event only. For all the other events is optional. NOTE: The value parameter should represent the value each event brings to your business, and not necessarily the product price. A ViewContent event will be fired on each product page visit, but a simple visit doesn’t mean that your business gain is equal to the product price. For the Purchase event only it makes sense to use the order value since this is the actual amount of money your client spends with you. In this area, Google Analytics comes with a better approach. They track product prices separately for each event, but only the Purchase event has a value parameter, equal to the transaction value. Fire the event on transaction only: with this option ON, the event will be fired only once, after the transaction is completed. It won’t be fired on a simple page refresh. If you need to test the event you might want to temporarily disable this option. Value is mandatory for this event, so you can’t turn it OFF. Important: This event will be fired on the order-received, the default WooCommerce “thank you page”. If you use PayPal, make sure that auto-return is ON. If you want to use “custom thank you pages”, you must configure them with our Super Pack. 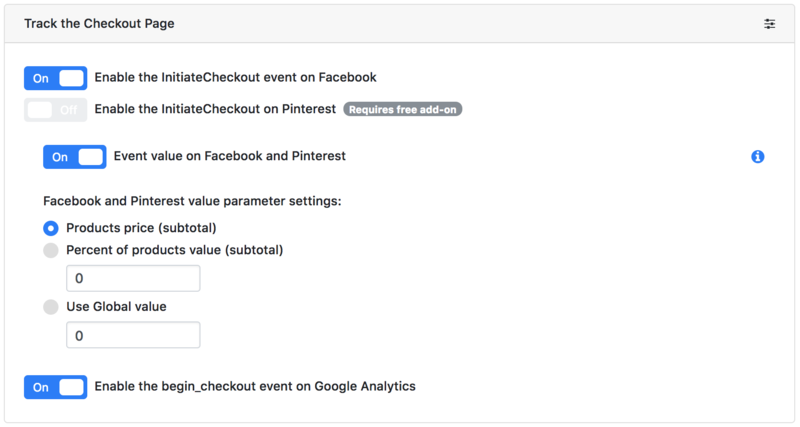 InitiateCheckout on Pinterest – Pinterest doesn’t have a standard event for this step, so we are using the same event as on Facebook, only that it will be a “user-defined” here. 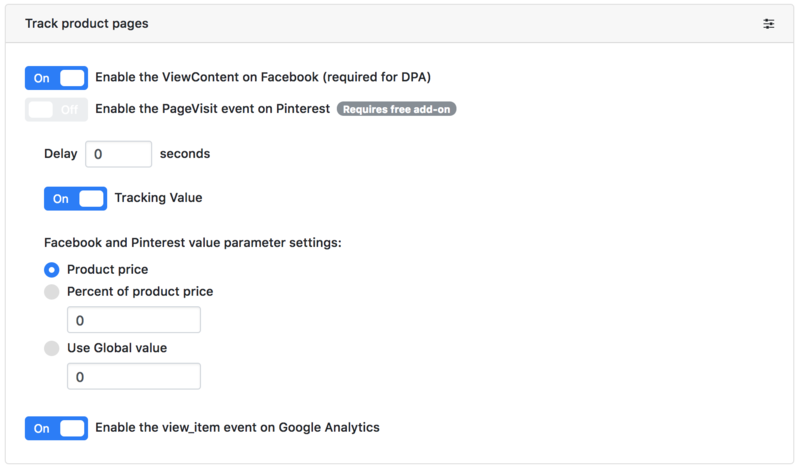 You can enable the value parameter for Facebook and Pinterest. Value is not mandatory for this event. If you want, you can enable and configure it to reflect the value this event has for your business. NOTE: this event will be fired according to your settings. This event will be fired when a product is removed from the cart. It’s a standard event on Google Analytics, but it will be just a custom event on Facebook and Pinterest.